Stories of smuggling in this district abound and some 200 illicit stills are reputed to have once smoked here in the Braes. Convoys of Highland garrons, laden with whisky ‘ankers’ or casks would regularly set out over the hills to supply markets throughout the north east and beyond. Ingenious methods were often used to get the whisky in to the towns - a common method involved using the bladder from a sheep or calf which was filled from barrels in some remote spot, then carried under women’s skirts, top hats, in milk pails, meal sacks and vegetable baskets - no doubt all of which contributed greatly to the maturing of the liquor! While the smugglers may have been ingenious in their deceptions, so the ‘gaugers’ or excise men were wily and often highly courageous in pursuit of their foe. One such was Malcolm Gillespie of Skene, Aberdeenshire, who was highly respected by the smugglers and on one occasion in the 1820’s set off with only one companion to challenge a large convoy on the way to Inverurie from Glenlivet. As he met up with the approaching whisky laden carts, accompanied by at least 30 men, he stepped out and shouted, “stop in the Kings name”. He was met with a gale of laughter, but undaunted, whipped out his pistols and shot the leading horse dead. The enraged smugglers immediately set upon him and though hugely outnumbered, Gillespie managed to injure a few with his remaining shot. Good timing saved him from almost certain death as more gaugers accompanied by the local militia, who had been forewarned, quickly arrived at the scene and averted an almost certain full scale battle. The militia however, were not too keen to get involved, as many were the customers of these self same smugglers. The upshot was that Gillespie got his carts of whisky and his life, but the smugglers escaped to try again. While whisky and water may offer employment to some, farming remains the mainstay of the local community - and to make ‘twae ends meet’ can be difficult, in these exposed parts, where the wind, rain, snow and bitter winter weather, combine to mould some hardy characters among the local population. The snow here can sometimes blow in with such force, it creates drifts as high as the cattle sheds and to step more than a few feet from your door may result in a major expedition. Many have fallen foul of such blizzards which can arrive suddenly and unexpectedly, and having lost their way finally succumb to the cold. One famous story involved a young girl, Margaret Cruikshank or the ‘Lass o’ the Lecht’ as she became known, who set off from Tomintoul one day in February 1860 to cross the Lecht Pass over the Ladder Hills. A gale sprung up and with it a violent blizzard, in which she became lost, following a burn she thought would lead to safety. In fact in the tragedy that unfolded, it was not the burn she supposed, and her route took her ever further into the hills. 500 men turned out to help in the attempt at rescue, but it was not until 3 months later that her frozen body was discovered in Strathdon, on the banks of the river Earnan, many miles from the Lecht. While Glenlivet looks to be a thriving agricultural and distilling centre today, 200 years ago it was a remote, cold and wet spot. However, it was these characteristics that made it a haven for illicit whisky distillers and smugglers. Before distilling was largely legalised by the Excise Act of 1832 there were reckoned to be some 200 illicit whisky stills operating in the confines of Glenlivet - and the distillers and smugglers did a roaring trade. Pack trains of laden ponies would regularly leave the confines of the glen, with an armed guard, and make their way down to the coast to Banff and Buckie, or the over the high passes of the Ladder Hills into Donside or the Carbrach. The whisky often reached Edinburgh's nobility, who referred to it as "the real stuff ". The remotest and wildest of them, the Malcolm Gillespie Trail, is named after one of the gaugers, or excisemen, who used to boast of the 42 scars he had on his body, all of them the result of wounds inflicted in skirmishes with the illegal distillers and smugglers.This particular trail begins at the East Auchavaich car park in Chapeltown of Glenlivet and circuits the Braes of Glenlivet at the head of the glen. It's ostensibly a fairly low-level route so I added on a little link to include the Corbett of Carn Mor. This link also made full use of the right of way that runs over the Ladder Hills from the appropriately named Ladderfoot, via the Ladder Burn, and down Glen Nochty to Bellabeg in Donside. It's also one of the high-level routes the whisky smugglers followed. A good path runs up the narrow corrie that contains the Ladder Burn, all the way to the shallow bealach called Dun Muir, just to the northeast of the Corbett. It's an easy enough stroll across to the trig point on Carn Mor but the way is torn and ravaged by a series of deep peat hags, miserable for the hillwalker but vitally important for the illicit whisky distillers. A plentiful supply of peat was essential to keep the stills burning, with as little tell-tale smoke as possible. SIXTY or seventy years ago the Braes of Glenlivet was a district little known to the outsider. Indeed, they are little known at the present day by many of the lowland natives of Aberdeen, Banff, and Moray, otherwise than by name but, if once seen, it would not be easy to forget them. The physical features at once strike the eye of the beholder as uncommon and peculiar. It is a region isolated, if I may so speak, from the neighbouring glens by high, and in many parts, precipitous hills, whose rugged aspect gives a wild and barren appearance to the whole district. On the east side of the Braes more particularly this is the case. A high range of hills a spur of the Grampians runs along the whole length of the glen, separating the counties of Banff and Aberdeen, and separating the Braes of Glenlivet from Glenbucket and Strathdon. On the north, again, a chain of the Corhabbie range runs from east to west, separating the Braes from Glenrinnes and Mortlach ; and on the east and south, a range throws its giant arms between the Braes and the Tomintoul district. Thus it will appear to the reader that the Braes of Glenlivet resemble, in many particulars, a loch ; or, as some have said, a punch-bowl. Their average breadth are, perhaps, four or five miles, and their average length about the same distance. Although the district is called the Braes, it is, comparatively speaking, a level country, and but for its high altitude and close proximity to the lofty mountains that surround it, finely adapted for agricultural purposes. As a natural consequence of lying amongst the hills, the climate is very damp and cold, and in many parts the soil, which is naturally good, is very marshy. When such is the case at the present day, with all the modern advantages of draining and superior cultivation, what must it have been sixty years ago? The Braes were then as wild a piece of country as any part of the Highlands of Scotland presented, and without even a tree on which the eye could rest a moment with pleasure, and inhabited by a race of people peculiar in many respects from their nearest neighbours a race possessing many of the virtues and failings of the ancient Highlander, and in consequence of the advancement of civilization, possessing fewer than many others of those evils which were the disgrace of feudalism. Their nature presented all the features peculiar to the Celtic character. They were brave, rash, and impetuous, but kind and hospitable to strangers, if they came as friends. Combined with these, they cherished a thorough contempt and abhorrence of law, in whatsoever form it might be administered. Situated as they were within their mountain fastnesses, with no roads, and with little communication with the outside world, and bound together with the ties of friendship and blood, it was no easy matter, when an offence was committed, for the arm of the law to reach them. This was seen fifty years ago, when the Government had determined to put an end to smuggling, which was then the staple occupation of the inhabitants of the Braes of Glenlivet. . 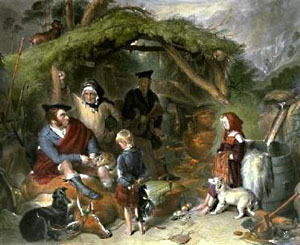 They went to it with a spirit and energy, which, had it been shown in the cultivation of the soil, or any other useful industry, the fruits of it would soon have been seen in the improvement of the country, and also of the manners and customs of the people, which, as may be supposed, were not at that time very highly polished. But where smuggling was carried on, they were even worse than elsewhere. It brought with it many evils and no good. It gave the people a lawless spirit, and by the exposure at all times, and at all seasons, which the successful carrying on of such an occupation necessarily involved, the constitutions of the people were undermined, and many of the fruits of that exposure, combined with a little dissipation, are to be seen in some of their descendants at the present day. Otherwise, they were a hardy race of men, men who would have shed the last drop of their blood in their country's defence, and many of them did so in the Peninsular War, where the Highland Regiments so much distinguished themselves. The firm and determined opposition to the servants of the law, was strikingly shown some fifty years ago, when the preventives for the first time entered the Braes of Glenlivet. The people heretofore had smuggled quietly at home, but now things had come to such a pass that this could no longer be done. They therefore went to the hills with the determination to fight to the last for their " stills," and they knew that in the hills the preventives could not tell one man's bothy from another. In this state of matters, they felt themselves to be secure as long as they could keep the preventives' hands off them, and they likewise knew that the preventives were at a great disadvantage in not knowing the hills. They might search for days and not come upon a single bothy. Some will even hint that they did not wish to find them, that they were afraid to do so. Perhaps this might have been the case with some of the preventives, but as a rule, they did their duty manfully, some of them doubtless overdoing it, and earning the inveterate hatred of the smugglers. Many are the tales told by men yet living, of the skirmishes, which used to take place between the smugglers and the preventives, some of them not altogether free from bloodshed. It was related to me by an old smuggler, that he and several companions (most of whom are still alive) were chased one day among the hills by a superior force of preventives and gangers with loaded weapons. The smugglers had only one gun and some powder but no lead. It was a very hard frost, and he, to procure a ball for the gun, in the shape of a small stone, knocked the toe from his brogue in the attempt. Fortunate it was perhaps for the whole of them that the attempt was unsuccessful. This little anecdote, from a trustworthy and highly respectable old man, will show the spirit with which they were possessed, and that they were prepared to go any length in defence of what they considered to be their right. And with all their perseverance, it only brought them ruin and poverty, and it brought them under the lash of the law that fell upon them with crushing force. The well-known John Milne o' Livet Glen wrote a rhyme, and had it printed, in which he described a skirmish which took place in the neighbouring valley of Glennochty. These ballads were sold at 3d. each throughout the neighbouring glens, which so irritated the gaugers and preventives that they procured some copies and sent them to Edinburgh, with a long complaint. The consequence was that a body of soldiers made their appearance soon after, along with the preventives. These gentlemen, finding themselves supported by the redcoats, went to work with such a will that they soon reduced the smugglers to the last extremity. Yet the soldiers did not relish the duty imposed upon them, and some anecdotes are told of their disinclination to support the preventives. One day the preventives were marching up a hill, with the intention of capturing some smugglers who were situated on the brow of it. They commenced to hurl down stones upon the preventives, partly for amusement and partly to annoy them. The preventives, seeing this, shouted loudly to the soldiers to come on. They were taking it quite easy a good distance in the rear. They advanced, however, to the bottom of the hill. The smugglers, on seeing this, desisted, but the officer in command of the soldiers shouted in Gaelic to throw down more. The smugglers at once obeyed, and with such effect that the preventives beat a hasty retreat. Leaving Auchernack, we trudged onward, for the dim twilight was now giving place to the darker and their native songs, relieved at intervals by the bagpipes, whose shrill notes made the wild hills reverberate. The few travellers who now cross the Ladder are generally natives of Glenlivet or Strathdon, or occasionally some tourists. Thinking on these old times, we entered a huge snow wreath which covered the whole of dark, swampy Monsack, a very dangerous piece of mossy ground, which lies in a hollow of the lull. It was the scene of John Milne o' Livet Glen's rhyme, entitled " Nochty's Glens in the Mornin'," in which he depicts afight between the smugglers of that glen and a body of preventives. The fight seems to have been a stiff one, if we ai'e to credit John, who says that fire-arms were used by the smugglers, and that one fellow's coat was bored in several places by the bullets, though the preventives were ultimately driven off. John, zealous of the honour of the Braes of Glenlivet, means to say that the smugglers who thrashed the gaugers were Brae's men, though there was not a single one of them there. The wreath which we had entered taxed our strength greatly, but at last we reached the top, and turned round and bade adieu to Strathdon and its kind- hearted inhabitants. We envied them not their lovely strath, for I am convinced that a better race could not inhabit it than now does. We began to descend, and soon reached Ladderfoot. Another half-hour, and we reached home, a little footsore and weary, after a walk of 30 miles; yet, the remembrance of that walk still gives me pleasure, for Strathdon and its inhabitants will ever hold a warm place in my breast. Among Noughty glens in the morning. Among the Noughty glens in the morning. They fled from it in the morning. Before he made versifying into a paid occupation John Milne had been a shoemaker at Demick (a ruined farmtown which is interesting for the way water has been led across flat ground to the mill pond) until his hands became crippled. Prior to that he was involved in whisky-making and probably involved in the 'battle' of Glenbuchat, on the other side of the Ladder Trail, when McBain and his gaugers were forced to yield. Milne probably got on well enough with the less devout element among the men of the Braes, but it is still surprising to find him anti-Catholic. Several poems condemn what was seen by many as an alarming increase in Papal power when the English Hierarchy was restored through the efforts of Cardinal Manning. The background to the verses below is that George Smith of Upper Drummin was the first to break ranks after the 1824 Act and set up a legal distillery - the Laird of Aberlour presenting him with a £10 pair of pistols for protection as he led his pack animals through the gauntlet of former fellow smugglers. John Milne had come round to the view that Smith was a local benefactor by the 1840s, when he had acquired the farms of Blairfindy, Nevie and Minmore and produced 200 gallons a week of high quality spirits. And may you whisky rin galor At your new still. 'Twill cure us a' . For anyone not completely expert in the old Scots tongue some translation may be welcome: 'hoast' is a cough, 'ankers' are four gallon barrels, 'wames' are stomachs, 'gizzen' is to dry up, and 'wizzen' is gullet. Illicit stills even reached Colditz! The brewing of alcohol in Colditz was pioneered by the Polish contingent, using methods similar to those used in parts of their homeland for the production of a fiery form of vodka. The British contingent quickly acquired the distilling technique using the sugar extract from jam, water and the yeast content of fruit. Maintaining a constant heat during the distilling process was a principal difficulty but use of body heat and electric light bulbs overcame this problem. Drew, Fergusson and Michael Farr, of The Durham Light Infantry, were responsible for brewing “Glenbucket” in a concealed still. Farr’s family had an association with gin manufacture and so brought an element of professional expertise to the venture. There was little difficulty in producing a brew with high alcohol content but overcoming the ghastly taste proved more of a challenge.